I recently came across a blog called “How We Montessori”. Montessori (named after it’s founder Maria Montessori) is a type of education whereby children are encouraged to guide their own learning. The focus is on developing an understanding of the world through independent discovery. Carers act as guides in children’s learning and embark on a journey of discovery with the child. Rather than traditional education where adults mostly give the child the correct answers, carers will help the child find the answers themselves. Sound complicated? Not really. You are probably doing a lot of it without even knowing. Have a read of the How We Montessori blog and you might be surprised. I found a post about their food preparation area. A special area for the child to do their own food preparation. It looks great and so organised! However, I just don’t have the space. The more I thought about it though I realised that Thomas does have access to most of these things. They are not in one designated area but they are available to him. He has a step so he can reach the kitchen bench and be involved in the preparation of food, he has a drawer where his plastic cups and bowls are – he loves to choose which cup and bowl he is going to use. We also have a shelf in our pantry where most of the things we use in our cooking are at his level (I would take a photo of the pantry to show you but I wouldn’t want to frighten you!). Each time we cook, I encourage Thomas to get the ingredients from the pantry. 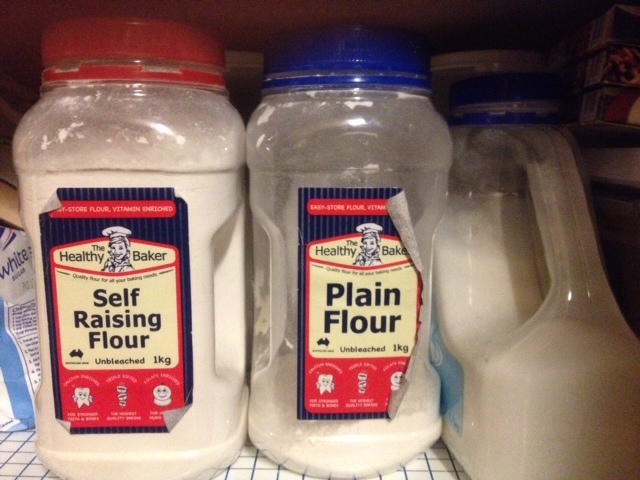 He is able to distinguish plain and self raising flour by the colour of the lids on the containers and the larger container with the handle is sugar. It’s all at his level and totally accessible to him. He has been known to go and get the flour out of the cupboard and bring it to me saying “I think we should cook something now”! 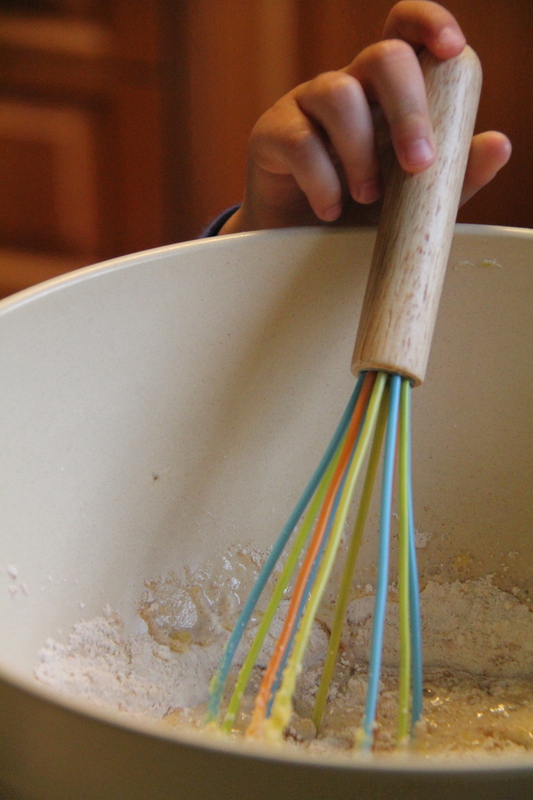 This simple activity of collecting ingredients is great for developing early literacy skills. By pointing out words on the containers, children are beginning to understand that print carries a message and can be used to distinguish one item from another. We had a glut of pears today so this recipe was perfect for a rainy day. They were absolutely delicious too! Recipe is from taste.com.au. Combine flour, cinnamon and sugar in a bowl. Make a well in the centre. Combine milk, butter and vanilla in a jug. Add to flour mixture. Whisk until smooth. Stir in banana and pear. Stand for 10 minutes. Spray a non-stick frying pan with oil. Heat over medium heat. 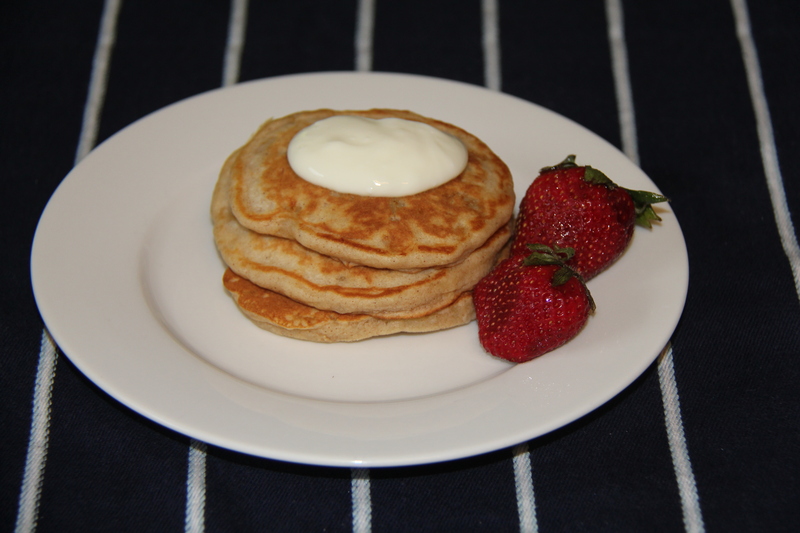 Spoon tablespoons of batter into pan to make 4 pikelets. Cook for 1 to 2 minutes or until bubbles appear on the surface. Turn. Cook for 1 to 2 minutes or until golden and cooked through. Transfer to a plate. Cover to keep warm. Repeat with remaining batter to make 16 pikelets.Thomas got some cooking equipment for his birthday from his Aunty including a whisk so he was – quote – “super dooper excited” to be using it to make these pikelets!